When I was a child, I thought Mother’s Day was so glorious. We’d wake my mom up super early for breakfast in bed, give her our homemade cards and gifts and then she’d get lots of hugs from all of us and the day was all about her. In actuality, the breakfast mess was cleaned up by her, she usually helped us to write the cards, she’s the one who cleaned up our breakfast mess, made lunch, made dinner for us and still cleaned up at the end of the day after putting all of us to bed. Now that I’m a mom, I can totally relate to the endless amounts of chores and making meals that need to be done multiple times a day (raise your hand if you’re with me!). Mother’s Day is coming up this Sunday, and for some reason I already know it’s not going to be the laying in bed all day, lazy Sunday I kind of want and need. But that’s not going to keep me from having a fun time celebrating all of the Mothers in my life who I appreciate. If you didn’t know, I’ve lived in Utah since I was 18 when I moved here to go to school (I’m originally from California, where all of my family lives). You can imagine, greeting cards have been a big way for me to send a thoughtful sentiment home to celebrate holidays, birthdays and especially Mother’s and Father’s Days apart. Between my mom, sister, mother-in-law, grandmas and mommy friends, I wanted to do something special to celebrate each of them because they have all had an impact in my life, and there’s that understanding now that I’m a mom. Besides, who doesn’t love getting a beautifully written card and a gift in the mail? They work so hard cooking, cleaning and always doing for others, I wanted to add a little something for each of them. It’s important to celebrate other moms because the job of mom is the hardest one any woman has ever taken on, we’ve got to support and love each other always, the struggle is real ladies. Since I don’t have my family around to celebrate Mother’s day here, I planned to have a few friends (who also have parents in other states) over so we could celebrate each other. 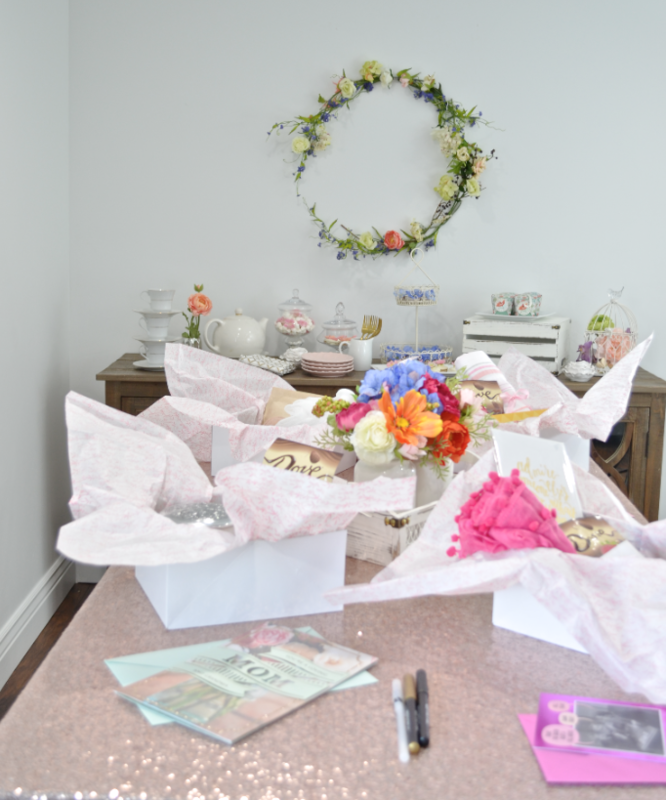 I decided to host a Mother’s Day Garden Party (complete with gift wrapping and card writing station) for us girls to have night in and to get our gifts wrapped and cards for our mom’s/sister’s/grandma’s done well in advance. I was able to find the perfect cards and gift wrapping supplies from American Greetings, that were a perfect match for my garden tea party theme. They had a huge selection of mothers day cards perfect for each of special moms in my life, check out more of them here. As far as gifts go, I arranged four different gift boxes and cards to speak to the things they might need at their current stage of motherhood. My Mother-in-law is ALWAYS going and doing for her kids, grandkids, community and work obligations. I love helping her when I can, but living a state away can make it hard sometimes. For my Mother-in-law’s gift I included some bath salts, body butters, a bath bomb, hand soap, essential oil infused bath drops and a loofah. She also loves Mary Engelbreit, so this card couldn’t have been more perfect for her. One of my best friends recently had baby number two, and although she has all of the essentials, I thought it would be a sweet gesture to give her a couple things for her and a couple for the baby. Her gift included some chocolate (did I mention that I LOVE this Dove chocolate? ), mothers milk tea, a soft muslin blanket and book for her sweet baby. The favor for each of the ladies attending was a few little things including some Dove fruit and nut chocolates, a pompom scarf, some jewelry and a positive quote that read “Admire someone else’s beauty without questioning your own.” I just wanted each of my friends to know that I loved them and appreciate having such great mothers as friends to help me along my journey of motherhood, especially this far away from home. Using pre-made gum paste, add a small amount of food coloring to five small sections and knead until the color is even. Immediately wrap in tinfoil so the colors don’t dry out. Cover a two-tier cake in fondant, roll out and cover (see package for full instructions). Using one color of gum paste at a time, roll it out into a thin layer and cut out flowers and leaves using a cookie cutter. For the leaves, use a leaf-shaped cookie cutter and remove the edges. Softly impress leaf lines with a fondant decorating tool or small knife. Using your fingers, fold the leaf in half and pinch the edges to soften them and make them look more natural. Repeat the same process with the flower cookie cutter and other colors of gum paste. Cut and remove the edges. Score the edges with a scoring tool and repeat on each petal. Using your fingers, pinch the edges to soften and gently fold on the line until the flower is uniform. To make the berries and flower centers, take a small piece and roll to the desired size in the palm of your hand. Poke the center with a toothpick to make it look more realistic. Set the finished flowers and leaves into a miniature muffin tin to hold their shape and add a small amount of water to the center. Add three rolled balls as the center of the flower and allow them time to dry overnight. The flowers are ready when they are have hardened completely. Wrap the cake in your choice of ribbon color and hold in place with a pearl pin. Using buttercream in a piping bag, pipe a dime-sized amount to the back of each flower and stick them on the cake. There is no right or wrong way to place the flowers onto the cake, just mix and match until it looks right to you. See my time-lapse video of me decorating the cake here. 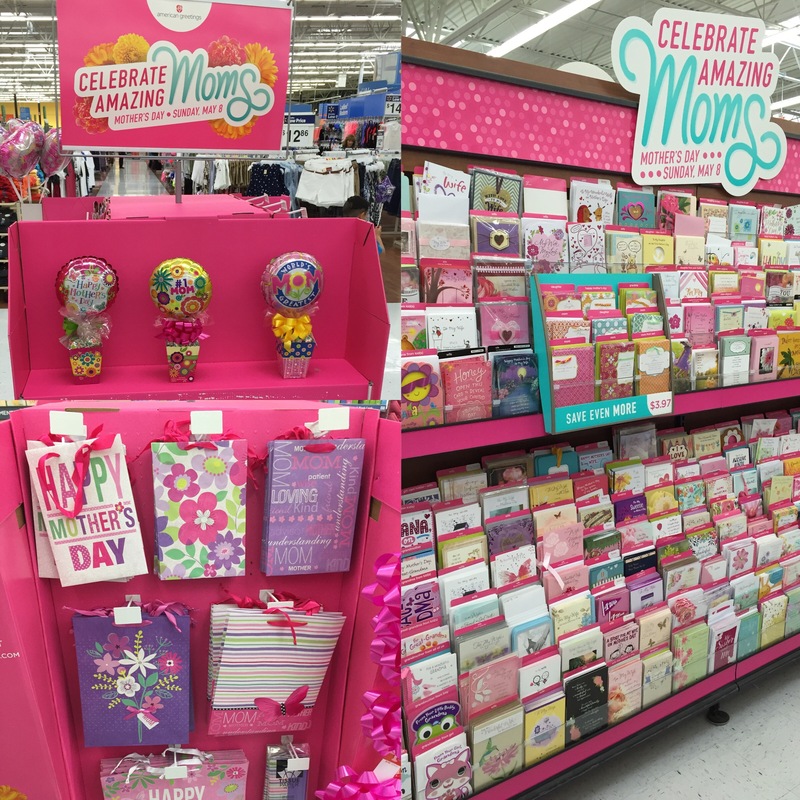 Make sure to get ready for Mother’s Day by stopping by at Walmart and grabbing all of the cards, tissue, bags, and gift wrapping solutions by American Greetings in the gift card aisle. Also, save $2 on your American Greetings purchase of $5 or more this this coupon. Don’t forget to follow American Greetings on Facebook and Pinterest for more inspiration. How will you celebrate all of the Mother’s in your life? Every mom is her own kind of amazing — and deserves to be celebrated for it. You also deserve to have some fun, too! So sit back, relax and take this fun little quiz to find out just what kind of mom you are.